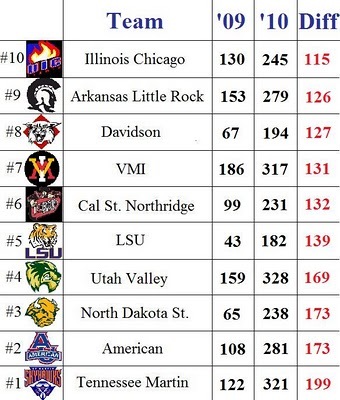 Mid majors have a much tougher time maintaining success. Obviously, five star recruits aren’t consistently coming in for most of the schools on this list. When Lester Hudson, Stephen Curry, and Ben Woodside emerge, they are essentially irreplaceable. In the coming weeks major conferences will be getting most of the attention. Predictions sure to be wrong will be flying in left and right. However, the lack of consistency at the mid major level makes it an even more difficult task than “guessing” Duke will have a good year. Senior guards can carry teams. Nearly all of these teams had a senior (in Curry’s case a junior NBA bound) guard being used on many possessions. Furthermore, most of these guards maintained great efficiency. Tennessee Martin is the ultimate example. UTM had just two seniors on the team. Lester Hudson (35.3% Poss) and Djero Riedewald (11.1% Poss) both were seniors on the ’09 UTM team. Clearly, “Done Ruthless” carried UTM. Offensively, UTM’s adjusted efficiency dropped from 107.1 to to 89.0. High volume and high percentage 3 point shooters are hard to replace. The 3 point shot has been well-publicized as the great equalizer. Losing this type of player creates two disadvantages. First, 3′s are simply better for scoring points. A 40% 3 point shooter creates 1.2 points per shot. A 50% 2 point shooter creates 1.0 points per shot. 0.2 points per possession may not seem very significant, but last year it was the difference between Duke’s offense and Idaho’s offense. Second, the threat of the long ball spreads the defensive and gives others more room to operate. Arkansas Little Rock is an exception. The Trojans are unlike most teams on this list. A senior guard did not carry the ’09 team. Shane Edwards, John Fowler, and Brandon Patterson were the three significant seniors on the team. These three don’t fit into Thornton, Carr, Woodside, Curry, Toolson (etc.) mold. In fact, ALR was a below average team offensively. However, defensively ALR went from 97.6 points allowed per 100 possessions to 110.5. Edwards and Patterson both were fairly effective shot blockers, but exactly what happened to ALR’s defense from ’09 to ’10 is unclear. Davidson was great defensively and average offensively. The Wildcat’s lost three excellent defenders after the ’09 season. Curry was 41st in the nation in Stl%, Gosselin was 136th in the nation in Stl%, and Lovedale was 138th in the nation in Blk%. The exceptional elite eight team thrived on both sides of the ball. However, the loss of Jason Richards was felt on offense. Defensively, Davidson remained one of the top teams in the nation. Curry’s switch to point guard was about as successful as possible, but it was Davidson’s defense that kept them relevant in the national spotlight following the spectacular tournament run.